Canis Major, with the bright star Sirius, is now fully above the horizon in the southeastern predawn sky. The constellation Canis Major with Sirius, the brightest star in the Earth's night sky, is now completely above the horizon at 6:00 AM on Sept. 18, 2018. Credit: Stellarium / Bob Trembley. The Moon joins Mars and Saturn in the southwestern sky after dusk for several days this week. The Moon, Mars and Saturn in the southern sky at 9:00 PM, Sept. 18, 2018. The marked location is Sagittarius A* – the supermassive black hole at the center of the Milky Way Galaxy. Credit: Stellarium / Bob Trembley. The Moon near Mars in the southern sky at 9:00 PM, Sept. 19, 2018. Credit: Stellarium / Bob Trembley. Jupiter and Venus in the southwestern sky at dusk on Sept. 18, 2018. Credit: Stellarium / Bob Trembley. The Moon is a waxing gibbous just after first quarter; visible in the southern sky after dusk, the Moon is an excellent observing target for the next several days. The Moon will be full on September 24th. The lunar terminator - NOT a rampaging cyborg from a dystopian future... but rather the division between the illuminated and dark hemispheres of the Moon. Observing the terminator on the Moon around the time of first or third quarters can be fascinating! Over the course of several hours, you can watch the shadows slowly change shape, and the tips of mountains and crater walls come into view, or vanish. Each night, a whole new set of craters and mountains become visible. The full Moon shows none of these shadows, and is considered much less interesting to look at by most sidewalk astronomers. The Sun has been spot-free for 5 days. The huge coronal hole at the Sun's north pole has gotten bigger - with a limb extending down towards the equator; several regions of coronal loop activity appear all along the equator. The coronal hole that started forming at the south pole last week has also grown in size. The solar wind speed is 530.4 km/sec, with a density of 12.0 protons/cm3 - the highest density I've seen in a while! 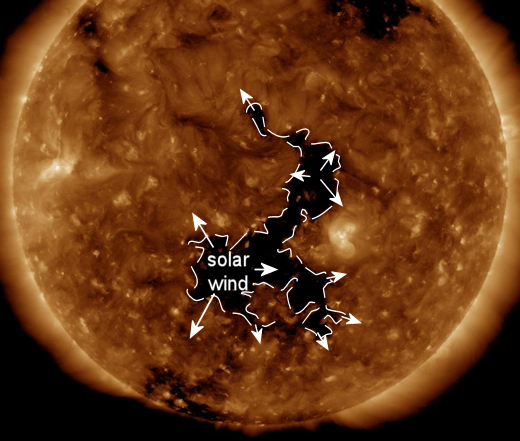 SpaceWeather.com says: "Earth is entering a stream of solar wind flowing from a hole in the sun's atmosphere. It's not a very fast stream, but at this time of year it could be enough to ignite Arctic auroras. Equinox cracks in Earth's magnetic field are lowering our planet's defenses against the solar wind, setting the stage for Northern Lights." Solar observing enthusiasts have been getting a treat for the last several days; numerous prominences appear all over the Sun's limb! I saw a beautiful straight pillar prominence through Diane Hall and Jonathan Kade's 40mm PST at last weekend's Astronomy at the Beach event near Milford, Michigan. Near-Earth objects (NEOs) discovered this month: 142, this year: 1255, all time: 18805. 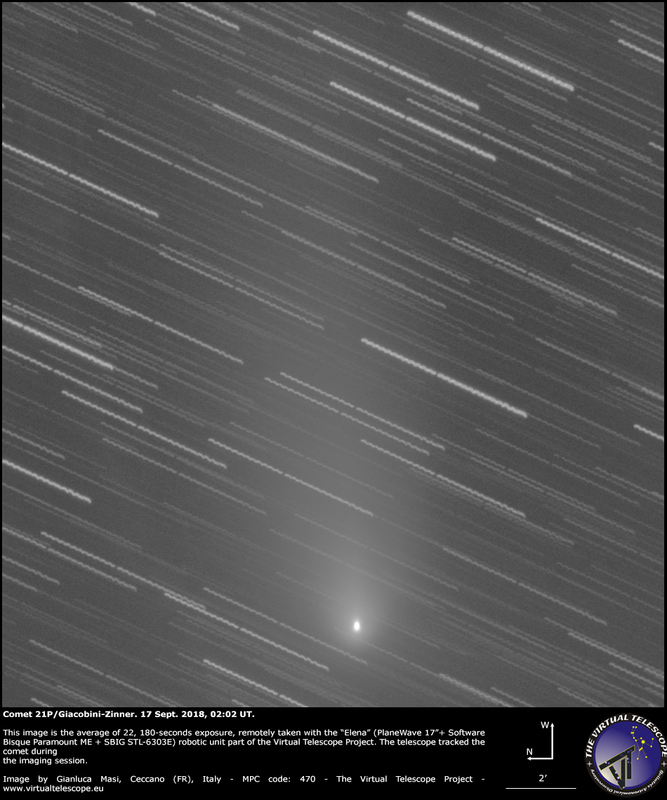 Comet 21P/Giacobini-Zinner is a binocular-viewable comet, visible in the eastern sky after midnight, and before dawn. The comet is fading - catch a glimpse soon! Location of Comet 21P/Giacobini-Zinner Sept. 15, 2018 4:00 AM. Credit: Stellarium / Bob Trembley. Position of the planets and several spacecraft in the inner solar system, Sept. 18, 2018. Credit: NASA Eyes on the Solar System / Bob Trembley. Position of the planets in the middle solar system, Sept. 18, 2018. Credit: NASA Eyes on the Solar System / Bob Trembley. Position of the planets in the outer solar system, Sept. 18, 2018. Credit: NASA Eyes on the Solar System / Bob Trembley. I was playing around with NASA's Eyes for this post, and noticed that Pluto really isn't a member of the "Ecliptic-Plane Club." Tilt of Pluto's orbit. Credit: NASA Eyes on the Solar System / Bob Trembley. Edge-on views of both the ecliptic plane and Pluto's orbit. Credit: NASA Eyes on the Solar System / Bob Trembley. The instrument-cover on a student-built x-ray spectrometer on NASA's OSIRIS-REx asteroid sample return spacecraft has opened! Fire Frangibolt! 💥🔩 Roger that. The Parker Solar Probe, the first mission to the outer corona of the Sun, is on its way to a Venus fly-by on Oct. 3rd. Parker Solar Probe Venus Flyby - Oct. 3 2018. Credit: NASA Eyes on the Solar System / Bob Trembley. The Mars InSight spacecraft will land on Mars on Nov. 26th. InSight has a seismometer and other instruments that will study the interior of Mars. InSight Nearing Mars atmosphere entry - Nov. 26, 2018. Credit: NASA Eyes on the Solar System / Bob Trembley. Bob, I work at the European Southern Observatory and I can say that we are starting to receive observing proposals for follow-up and confirmation of TESS exoplanet candidates. Nothing that I can disclose now, other than saying that TESS is living up to expectations and that exciting announcements will be coming soon! I was manning the Warren Astronomical Society table at last weekend’s “Astronomy at the Beach” event in Michigan; I had a graphic showing: TESS, Parker Solar Probe, Mars InSight, and OSIRIS-REx – of the hundreds of people I spoke with, only a small handful of passers-by had heard of any of the missions. I think only a single woman had heard the word “Exoplanet” – everyone’s eyes got wide when I explained that the Kepler/K2 Mission confirmed over 3700 planets orbiting other stars, and over 4000 more are awaiting confirmation… and TESS was going to find a BOATLOAD more! My family and I will look “inward” toward the center of our Galaxy tonight! I’m not sure why but there is something very calming/satisfying in knowing your physical orientation in the Milky Way! I’ll have to observe the “Terminator” too!